A paradigm shift is taking place in the 21st century from linear production efficiency towards circular resource use efficiency which can lead to a zero-waste target, said Dr Martin Scholten of Wageningen University and Research, The Netherlands. He explained that this involves optimizing resource use efficiency at agro-food system level where agro-biomass, including crop residuals, food waste and manure are used as organic fertilizer to produce food through crop cultivation. This circular resource supports sustainability for people, planet and profits, according to Dr Scholten. 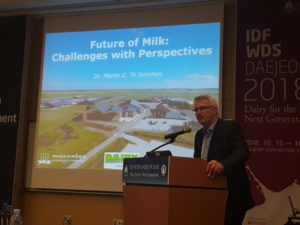 He was speaking on The Future of Milk: Challenges with Perspectives at the IDF World Dairy Summit 2018 in Daejeon, Korea, on 16 October. 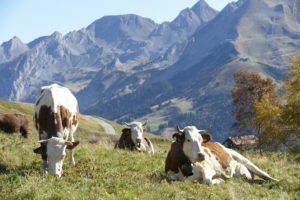 “Circular food is climate smart through more efficient use of crops, no specific feed production, better agricultural land use, low emission husbandry, smart use of manure, bio-base organic fertilizing and more carbon sequestration,” said Dr Scholten.